Essentially the simplest method of providing controlled rotary motion to a ballscrew on a linear stage, for example, stepping motor drives may be applied successfully under the following conditions. A standard 2 phase winding stepping motor, consists of a laminated toothed stator, wound with two centre-tapped coils, surrounding a 50 pole hybrid rotor, free to rotate. The rotor is a magnetised permanent magnet made from laminated discs. Due to this magnetic structure, a stepping motor will assume a static position, de-energised and naturally resist rotor displacement. The four windings of this motor are connected, with centre taps, as in Figure 1. To rotate the stepping motor, current must be switched sequentially on and off in these 4 windings. See Figure 2. A standard 2 phase stepping motor has 200 natural positions or steps, where it will naturally stop, making each step angle 1.8 degree. If the step sequence is changed and the 4 phases of the motor are switched in a different sequence, Figure 3, then the motor will make 400 steps per revolution, 0.9 degree per step. This is a very useful feature and doubles the system resolution. While this appears a simple solution to the control of rotary motion, the stiff resistance of the energised motor to movement when energised, along with the rotary inertia of the motor appears as a classic spring-mass system. This can result in mid frequency natural resonance in the 50 to 150Hz range. kind can help, but not cure, this unwanted effect. The technique of microstepping a stepping motor can alleviate this effect greatly and microstepping is described later. Any stepping motor operating dynamically must be treated in this open-loop control mode with care. The execution of a typical move from rest to rest again is shown in Figure 4. 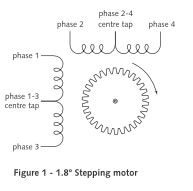 A stepping motor can be started and stopped almost instantaneously up to a certain limit of stepping rate at full 1.8 degree steps per second. This is the STOP/START rate. For a 23 frame motor this ranges from 400 to 1000 full steps per second. 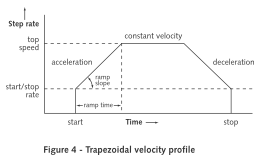 Above this rate the motor must be accelerated and decelerated in a controlled manner, usually trapezoidally as shown. The chosen acceleration and deceleration for a given load/motor combination should move through the possible motor resonance region without allowing de-synchronisation. 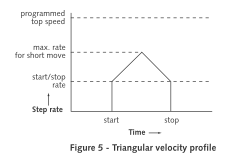 Note that short moves may not allow the maximum velocity required to be attained. See Figure 5. The electrical property of Inductance is the main culprit in a stepping motor winding that opposes attempts by conventional means, to make current switch more quickly through these windings to cause higher speed rotation. At low step rates, the current has sufficient time to flow effectively through the windings and produce motor torque. See Figure 6. 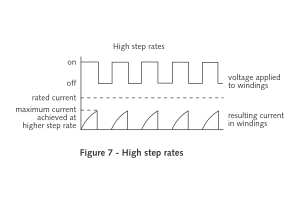 Figure 7 shows the effect of a higher step rate, where the winding Inductance, at that rate, causes the winding current to lag behind the applied voltage to such an extent, that the current required to produce the motor torque is not available at those higher step rates. 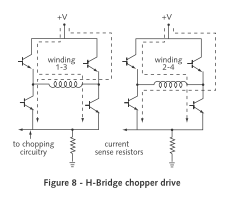 higher voltage to the windings for a short time until the current required flows in the winding, see Figure 8. At this point the current is switched through one leg of the H bridge safely. Generally this chopping effect takes place in excess of 20KHz and is mostly inaudible. This technique allows the stepping motor to operate most efficiently and reliably at higher speeds. 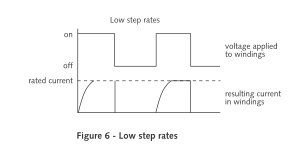 While standard stepping motors offer 200 or 400 steps per revolution before microstepping, there is a range of stepping motors which offer 500 or 1000 steps per revolution. They have 5 windings and the logical switching of current in those windings gives either 500 full steps or 1000 half steps per motor revolution. Fitted directly to a 1mm pitch ballscrew on a linear stage for example, a 1000 step stepping motor will produce a useful, direct Linear resolution of 0.001mm, 1 micron per step. It should be noted that open-loop control gives no “feedback” that a commanded position has been reached. As stepping motors are open-loop devices, then arrival successfully at a commanded position depends on correct matching of the motor to the load and the dynamic performance of that motor in moving that load consistently. By gradually, sinusoidally increasing current in one winding and by the same degree decreasing current in the 2nd winding, standard 4 winding stepping motors can be made to “microstep”. When the changing currents are stopped and held at the last current state then the motor will stop and stay in a stable position between magnetic poles. Microstepping between 2000 to 52000 steps per revolution is now normally available. It should be noted that higher values of step division do not necessarily result in exactly a move, when that one pulse is given. It may take a few pulses on a particular stepping motor with its load, to effect a step move. The Motor torque must be generated sufficiently to move the load. 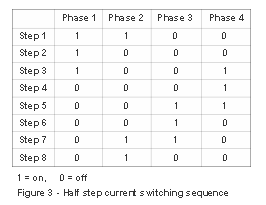 Microstepping by its nature does not give large changes in current to the motor. The result in reducing resonance effects is excellent. The system however is now generating many step pulses to move a smaller distance and high-resolution stepping systems may only be able to move over longer distances, slowly. With 5 phase stepping motors, drive systems are now offered with up to 125,000 steps revolution and resolution selection can be achieved within the control system.